Junk and Rubbish Removal Services in Rhode Island. 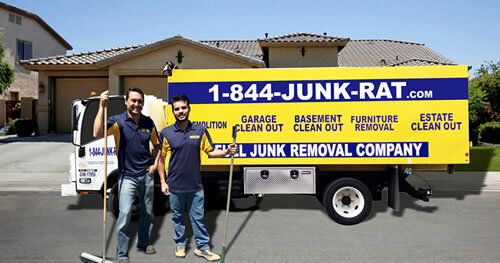 At 1844-Junk-Rat – junk and rubbish removal in Rhode Island is made easy… because we do all of the work! 1844-Junk-Rat.com understands that along with progress come the junk of the past. We offer e-waste hauling services for schools, commercial areas, offices, residences and retail locations at a fraction of the cost of our competitors. These days, E-waste makes up a large part of most waste in the country, even more so in Rhode Island. 1844-Junk-Rat.com is here to serve your needs by getting rid of all of your unwanted electronic waste in a way that’s in line with good environmental practices. We donate useable items locally, and recycle materials that apply to keep the landfills clean. There is no job to big or to small, and we handle all the work for every project. When you call our office, you will get a no nonsense quote for your project before you book an appointment. Our professional hauling staff makes sure to respect your space, and will even clean up the area after the last item is loaded on the truck. Now that we have a pair of small toddlers at home, we decided to get rid of all that easy to soil carpet in favor of hardwood. The flooring company did offer to haul away the old carpet, but at a whopping $200! On top of what we were paying for the floor it was just too much so we looked around for a reliable Carpet Removal company that fit our budget. 1844junkrat.com/ had several good reviews from in the Providence area so we decided to call. The kind receptionist was happy to set up a time for them to come out over the weekend which worked great with our schedule. I thought we would have to take the carpet up before they got there, but they told us that’s included in the service. Great news since it would be hard to manage with two little ones! They come on time and had the while house free of old carpet in a little less than two hours. They charged WAY less than the flooring company, and still came in under many other local haulers. Very happy with the whole thing, I am sure you will be too!